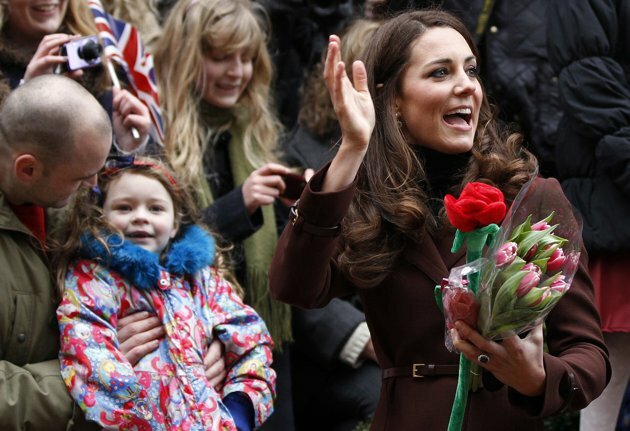 Britain's Catherine, Duchess of Cambridge visits Alder Hey Children's Hospital in Liverpool February 14, 2012. Catherine's husband Prince William is currently posted overseas, as a Royal Air Force helicopter search-and-rescue pilot stationed in the Falkland Islands. Britain's Catherine, Duchess of Cambridge (L) shakes hands with people in the crowd after a visit to The Brink, an alcohol-free bar in Liverpool, northern England, February 14, 2012. Catherine's husband Prince William is currently posted overseas, as a Royal Air Force helicopter search-and-rescue pilot stationed in the Falkland Islands. 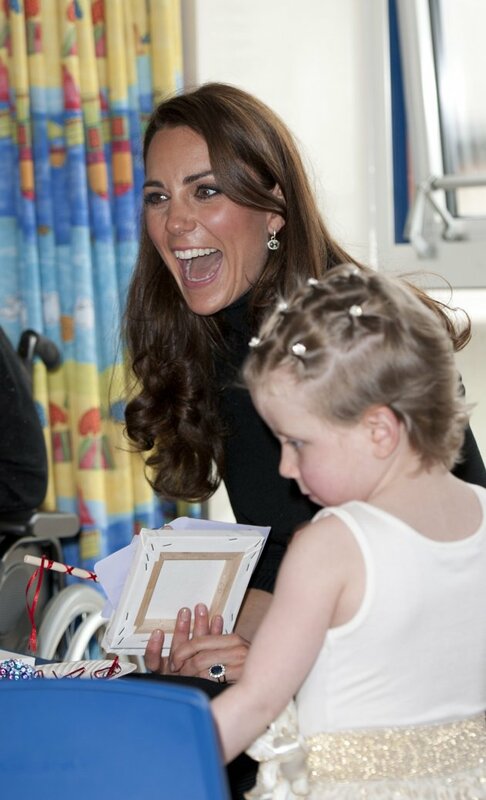 Britain's Catherine, Duchess of Cambridge speaks with patients during her visit to Alder Hey Children's Hospital in Liverpool February 14, 2012. 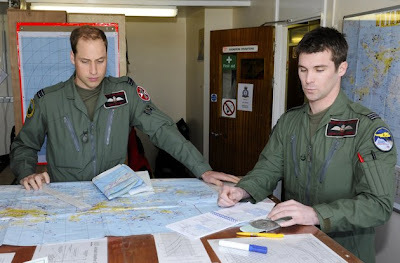 Catherine's husband Prince William is currently posted overseas, as a Royal Air Force helicopter search-and-rescue pilot stationed in the Falkland Islands. Britain's Catherine, Duchess of Cambridge (L) places a straw in a drink called the Duchess, with Jacquie Johnston-Lynch (C), Merseyside head of service for Action on Addiction and Paula Carey, at The Brink, an alcohol-free bar in Liverpool, northern England, February 14, 2012. Catherine's husband Prince William is currently posted overseas, as a Royal Air Force helicopter search-and-rescue pilot stationed in the Falkland Islands. Britain's Catherine, Duchess of Cambridge drinks a smoothie named the "Duchess" during her visit to The Brink, an alcohol-free bar in Liverpool, northern England February 14, 2012. Catherine's husband Prince William is currently posted overseas, as a Royal Air Force helicopter search-and-rescue pilot stationed in the Falkland Islands. Britain's Catherine, Duchess of Cambridge speaks with a boy while visiting Alder Hey Children's Hospital in Liverpool February 14, 2012. Catherine's husband Prince William is currently posted overseas, as a Royal Air Force helicopter search-and-rescue pilot stationed in the Falkland Islands. LIVERPOOL, ENGLAND - FEBRUARY 14: Catherine, Duchess of Cambridge visits Alder Hey Children's Hospital on February 14, 2012 in Liverpool, England. Catherine, The Duchess of Cambridge is in Liverpool visiting charities in the city without husband Prince William who is serving in the Falklands. Later she is to visit Alder Hey Children's Hospital and Ronald McDonald House. FALKLAND ISLANDS - FEBRUARY 04: (NO SALES/NO ARCHIVE) In this handout image provided by the Ministry of Defence, Prince William, Duke of Cambridge (L) and his crew prepare for their first sortie of a six week deployment on February 4, 2012 in the Mount Pleasant Complex, Falkland Islands. Operating the Sea King Mk3 as part of 1564 Flight, their duties as part of the Royal Air Force Search and Rescue team include assistance to the vast array of shipping around the islands and mountain rescue, in addition to providing cover for the aviation assets based on the island. Flt Lt Wales is a fully qualified SAR helicopter pilot and this is his first overseas operational deployment.